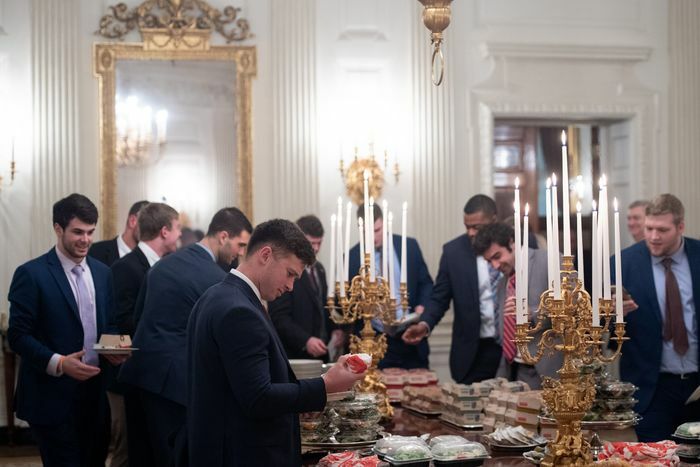 The Root: When Filet-O-Fish aficionado Donald Trump invited the Clemson Tigers to enjoy the White House’s first Presidential Value Meal, most of Clemson’s national championship football team members jumped at the opportunity to meet the original cheeseburger-swallowing clown. But The Root has learned that Clemson’s black players, some specifically citing racism and their disdain for Trump’s divisive politics, passed on the opportunity to hang out with the real-life Mayor McCheese. Submitted by bizgrrl on Wed, 2019/01/30 - 9:14am. The players that did go wore suits and ties in respect for the White House. What did they get? Big Macs. They could have worn t-shirts and jeans. Submitted by Moon on Wed, 2019/01/30 - 10:09am. I have two friends on the Clemson staff who have made multiple national championship White House visits, as players, coaches and administrators. I've spoken with them, as well as 3 players about this DC trip. Between them, those five guys have 13 NC White House visits. Those 3 players said they had a blast at the dinner and don't understand the negative outside reaction. The two coaches sincerely loved the hamburger dinner and thought it provided the kids with a great story. Submitted by WhitesCreek on Wed, 2019/01/30 - 7:42pm. 57 Black players did not attend. That would be essentially all of the upper classmen. Can anybody find the team picture with Trump? This one looks fairly light.